Oil prices are back above $50 per barrel and it looks like the Dow could extend a winning rally that began last week. 1. 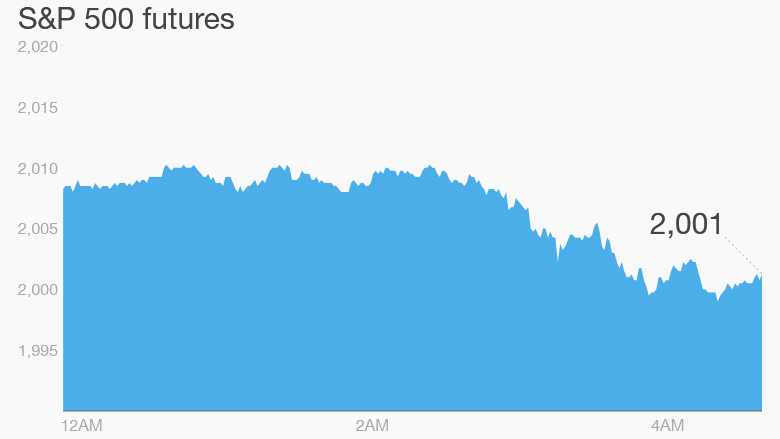 Market overview: U.S. stock futures are sitting around the levels where they closed on Thursday while global markets rally. European markets are all up in early trading, boosted by mining and energy companies. Germany's DAX index is rising 1% Friday. Asian markets ended the session with gains. Minutes from the September meeting of the Federal Reserve came out Thursday afternoon, revealing the Fed was worried about the impact of the slowing global economy when considering whether to raise interest rates. These minutes pushed the dollar down and gave a boost to commodities. Crude oil futures are now trading around $50.40 per share. 2. Stock market movers -- Alcoa, Gap, Glencore: Shares in Alcoa (AA) look set to drop by 4% at the open after the company reported a disappointing set of earnings on Thursday evening. Investors were unimpressed by a 5-week sales report from Gap (GPS) and shares are dipping by about 6% in extended trading. The battered mining giant Glencore (GLCNF) announced Friday it will cut its zinc production by a third. The cutback will see the world's zinc output drop by 4%. Investors responded by bidding shares up by 8% in London. Glencore's shares have more than halved this year as investors worry about low commodity prices. 3. Listening to Lima: Hot shots from the International Monetary Fund and the World Bank have converged for a big annual meeting in Peru's capital city. Investors are paying very close attention. "Sideline commentary from global policymakers ... may disrupt otherwise quiet consolidation into the end of the week," said Ilya Spivak, currency strategist at DailyFX. On Thursday evening, the IMF's managing director Christine Lagarde called China's economic slowdown "healthy", saying it was the result of much-needed reforms. The IMF had downgraded its world growth forecast earlier this week. 4. Thursday market recap: Markets were up Thursday. The Dow Jones industrial average rose 0.8%, the S&P 500 climbed 0.9% and the Nasdaq added 0.4%.